As our attendees poured into the Stephen M. Ross School of Business at 9:00 A.M. on Friday, April 13th, 2018, they did not stumble into the naturally lit business school our campus is accustomed to; rather, they entered a black and white mirage of edged lines, ‘corporate-chic’ styled mannequins, engaging activations and, of course, Registration presented by Tommy Hilfiger. It was at this point that they received giveaway bags filled with Hard Candy makeup sets, Sugarfina candy, Cuveé Beauty samples, and more; but most importantly, they received their personalized credential passes for the day. After five months of rigorous planning, the inaugural Michigan Fashion Media Summit (MFMS) was brought to life. The Robertson Auditorium began to fill with attendees dressed head to toe in ‘Corporate Chic,’ music bumping and energy radiating throughout the room. The lights dimmed, and as the crowd quieted down ready to get the day started, we posed a question that themed the day: “What is the future of fashion?" She then introduced our host for the day, Amy Levin, Founder & CEO of College Fashionista. When she was a student at Indiana University, Amy struggled to obtain fashion experience while on campus so she created her own from her dorm room in 2009. Today, College Fashionista has grown into a global community of students who are interested in fashion, beauty and their careers. Amy and her brand play an integral role in impacting their community members’ lives by giving them industry access from their college campuses. “The MFMS mission reminds me so much of the start of College Fashionista. I am honored to host the first ever Michigan Fashion Media Summit,” Amy said. After kicking the day off on an inspiring note, she introduced our Morning Keynote. Gary Sheinbaum, CEO of Tommy Hilfiger Americas, then took the stage to address our audience for the Morning Keynote. While the details of his jaw dropping presentation are highly confidential, we can share that he completely owned the Robertson stage and captivated the sold out audience. Gary not only educated and entertained the MFMS attendees on the Tommy Hilfiger business and brand initiatives, but he also inspired the next generation of fashion industry leaders from the get-go. In regards to the future of fashion and how his team approaches each and every day, Gary said, "We are constantly looking to innovate and disrupt” and continued to delve into the subject by saying, "Every season we reinvent. Every season we challenged our designs." Why is this so key? According to Gary, “It is no longer the big company taking over the small one. It is really the fast, tech-savvy company taking over the slow one.” And clearly it’s working for TH. In the inspirational piece of his keynote, Gary tied back to our project. “This is sustainable; this will continue, this is just the beginning,” he said about the MFMS, coining our team as the “fabulous forty.” But from the Student Planning Committee perspective, nothing was more fabulous than having the honor to host such a successful CEO as the first speaker of the MFMS. We then realized that if we were making innovative strides at the collegiate level to change the future of fashion, others must be too. Under the name ‘Blue and Bella,’ U of M sophomore Sarah Agnone designs and creates unique, custom jewelry that reflects shapes and colors inspired by the Sonoran desert. Gracious Mfg. began when U of M junior Harry Epstein turned his passion for art into a brand and his basement into a screen printing studio in 2013– the beginning of a uniting of a broad audience through a love of fashion. With globally-sourced materials and constant technique and design experimentation, Beaded by Marley’s pieces have evolved from beaded bracelets into a full jewelry line. Senior at Syracuse University, Remi Lubcher, perhaps better known as the brains behind Snipped and Styled, began the tailgate-chic trend that has taken college campuses across the country by storm. Blogger, photographer, and overall content creator Toraki Maehata is a junior at Michigan State University, and a key force behind Modern Man Journal out of Los Angeles, California. Benny Morris, A-List Designs LLC. Through social media and sites such as Shopify, Benny’s original A-List Cases’ presence grew as he and his partner, Jack Settleman, partnered with athletes like John Wall to create their “Signature Series” phone cases. They then merged with a social media company based in Oklahoma to expand their case business into the apparel segment, now known as A-List Design Shop. Robina Rranza combines her passion for upcycling clothing with her interests to break the boundaries of mainstream fashion trends through her designs. A sophomore at Marist College, Dylan’s unique creations have been a part of three different fashion shows, finding a medium between personal vision and girls’ comfortability in each one. By producing hand dyed and uniquely designed releases every day while never repeating work, Cole and his team are tackling high demand, untouched niches in the streetwear space via bidding on Instagram. Handmade, locally-produced, and inspired by and named after places in Michigan, Root Swim pieces fuse minimalism and timelessness, providing hardware-free bathing suits with no clasps or wire. Amy then introduced our first panel of the day: “Behind the Scenes Part I: Revolutionizing Retail.” While both Behind the Scenes part one and two were each designed to uncover the hood of fashion, part one allowed us to check out what the top industry mechanics are tuning up in regards to technology and retail strategy. This conversation was moderated by U of M Professor and Director of Partnership Activation & Event Retail at adidas America, David Cho, who took us through the ins and outs of this all-star team that is changing the landscape of retail every single day. Indeed, all of these men have been at the forefront of their brands, whether it’s serial entrepreneur Ben Fischman, the brain behind Lids, Rue La La, and now his newest venture, M.Gemi, Ronen Lazar, Co-Founder and CEO of INTURN, a startup that is changing the narrative around excess inventory, or Alex Drinker, the VP of Marketing elevating the Shinola Detroit brand to a household name. What is most important to these men in the workplace, you may ask? People. How is Shinola creating that obsession? “For us, it’s the transparency of our business,” Drinker said, doubling-down on his comment by adding, “We sell our products for about 4 times what they cost [to make].” While counterintuitive on the surface, the approach is clearly resonating with their customers as the Shinola brand continues to skyrocket. After Panel 1, we broke for lunch. Of course, we couldn’t let our attendees and VIPs come to Ann Arbor without having some famous Zingerman’s! Thank you to Steve Madden for hosting our lunch, and decking out the Blau Colloquium in style and savor. While Rachel Zoe could not attend the MFMS due to an overlapping business trip, she was so passionate about our mission that she decided to film a Q&A to offer our attendees some insight into her background, business, and personal life. Check out this MFMS exclusive video that captures questions straight from the audience to Rachel’s office. Will Rachel Zoe be speaking at the 2019 MFMS? Stay tuned. Following Rachel Zoe, we went back “Behind the Scenes” to discuss “Finessing Fashion’s Influence” with Ashley-Brooke Sandall, Director of Strategic Partnerships at Council of Fashion Designers of America, John Mezzo, VP of HR at Michael Kors - Retail, and Meredith Paley, VP of PR at Talbots. This conversation, moderated by Jill Manoff, Editor-in-Chief of GLOSSY, showed us the world of fashion through a business lens, and, in turn, gave us the inside scoop on how these fashion executives use influencers to maximize their reach through collaborations, runway shows, and social media promotions. “The fashion industry is ultimately a business,” said Sandall. While she may not have attended a fashion-centric university, she was able to leverage her U of M education and network to make a name for herself in the fashion industry. She echoed the MFMS mission to break the stigma associated around fashion. After all, it is a business. Sandall’s commentary segued fluidly into Mezzo’s insight into the hiring process within the fashion industry, specifically for a corporation that makes an impact as large as Michael Kors does. He highlighted a crucial part of creating a personal brand: “Be authentic, be real, be you. That’s the only thing you have that no one can take from you.” This is career advice that is not only applicable to the fashion industry, but to any field an aspiring future leader hopes to enter. All three have had experience in positioning their personal and represented brands in the news, on social media, and in stores, while navigating the constantly changing landscape of online retail and trend forecasting. We’re just lucky we got to go “Behind the Scenes” for a brief panel. Next, we held our breakout sessions–three separate panels more specifically targeted to the niche interests of the individual members that composed the MFMS audience. Each attendee got to choose which panel they attended, as each panel offered a unique angle into the fashion industry. 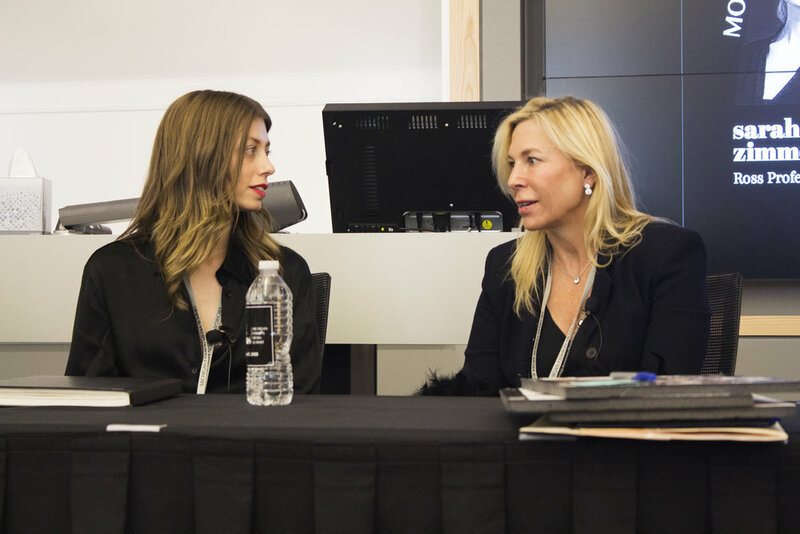 From marketing, to design, to entrepreneurship (U of M style), the MFMS breakout sessions simultaneously covered different niche spaces within the fashion landscape and physical ones within the Ross School of Business. While the panels were unique in nature, each session brilliantly touched on how different brands within the industry put the customer at the center of the conversation. Our first breakout was tasked with cracking “The Millennial Algorithm,” arguably the most important front facing retail businesses today. Gerry Bonomi, President of Madden Girl, Gina Pak, VP of Consumer Behavior at Theory, and Zara Terez Tisch, Founder of Terez, joined Marly Graubard, International Fashion/Luxury Director for Hearst at Marie Claire (and U of M alum) who led these panelists through a series of questions to help break down the equation and uncover why millennials matter so much in today’s shopping experience. Maybe it has to do with the “74 million millennials that spend 1.5 trillion dollars a year,” according to Bonomi, who has been running the Madden Girl business since 2011. In today’s world, millennials have the power to make any purchase, at any time of the day, right at their fingertips. While shoppers are no longer confined to 9 to 5 shopping hours, we are continually fed advertisements and shopping reminders every second from competing brands. So, how do Steve Madden and Madden Girl stay in touch with their consumers and feed them fresh, innovative content? “[We] look at them more as the mobile generation rather than the millennial generation. We go after their nature–the things they wanna do. We go after them by appealing to what is the most important things to them. We go after it through music, entertainment,” said Bonomi. Gina Pak then added, “[We] look at how people are wearing a product and how we can get them to wear it in their lifestyle, so that the person is first and the product is second.” Traditionally, brands were able to get away with pushing their ‘style agenda’ onto their customers; however, in today’s world, a place where millennials have indispensable buying power via Instagram, Facebook, and more virtual platforms, it is crucial for longstanding brands such as Theory and Madden Girl to shift their businesses–and fast. But with our generation on every platform, the question then becomes: Where should brands start? As a millennial herself, Zara is able to capitalize on being “in-the-know” with trends, styles, and the impact of the purchase to the consumer. “It’s not about the platforms. It’s about creating and innovating on experiences,” Zara said. While other brands are running to throw products at their customers via social media, hoping they’ll turn a few clicks into dollars, Zara takes a millennial approach. She shared, “It’s not really about the product, but it’s about the why. Why do we do this? Why do we exist?” Yes, social media is the ‘go-to’ spot to find millennials, but it is not the only way millennials are shopping in today’s world. Zara’s focus is on creating experiences that connect with her customers and create lasting brand associations, regardless of where or how it happens. No longer can any company just try to sell a sneaker, a suit, or a pair of leggings. Retailers must personalize, customize, and create a persona for their brand. And based on this conversation, it is obvious that these three fashion marketers are focused on the millennial algorithm everyday. But bleeding blue hasn’t necessarily always met the level of passion that runs through the same veins of a Michigan Alum. Impressively, all three of these panelists have made a major impact on the fashion industry without a University of Michigan-fed fashion or retail program. “At the time, I didn’t even know I wanted to go into to fashion. But it was my well-rounded education here at Michigan that opened up my eyes to the fact that there are various careers I can explore, and various Michigan support groups and alumni bases to help me,” said Melissa Fleis on the subject. Tracy touched upon “The Michigan Difference” as well: “Naturally, I was a huge Michigan fan. But I was tired of seeing the same menswear attire, and knew there was a market for female-centric college clothing. I had years of experience in fashion under my belt, giving me the confidence to dive into this untouched market and make a difference–starting here, at Michigan.” For her, Michigan uncovered an untapped niche that she was able to turn into a business. As we learned, each female entrepreneur on the panel remained in touch with their Michigan professors and peers, allowing them to grow their businesses through the mentors that they met here in Ann Arbor. Today, Jordana has partnered with Madden Girl to create a new custom line, Melissa Fleis is an independently operating retail business, and nuyu remains at the top of the athleisure world. Each of these panelists is a testament to what being the ‘Leaders and Best’ really means at U of M.
The “Defining Design: Tailoring Everyday to Runway” panel touched upon all things finding creativity and filling a void. In this breakout session, panelists Mindy Scheier, Founder and President of Runway of Dreams, and Pamela Dennis, Designer and Celebrity Stylist, were guided through an engaging and intimate conversation by moderator Emily Blumenthal, Founder of the Independent Handbag Designer Awards and Professor of Entrepreneurship at the Fashion Institute of Technology. Each speaker highlighted the importance of research, really crafting a passion, and discovering a niche before undertaking a design project. “To really start something, to really create something in white space, you have to know what youre talking about,” said Mindy on the topic of conducting a year of research about the disabled community before developing Runway of Dreams. They addressed the intersection of passion and fashion, Mindy highlighting, “[That intersection] is only a sprinkled addition to finding the space in life that you are passionate about and filling that void.” Emily followed with an important and relevant notion on the role that determination plays to the college-aged demographic that filled the room. She said, “You’re here to launch something, you’re here to create something. You can sleep when you’re older.” After putting on this summit, we couldn’t agree more. One of the primary objectives of the MFMS is to build a network to connect the U of M community with the fashion industry outside of Ann Arbor’s borders. To execute on this promise, a portion of the day was devoted to The MFMS Networking Break sponsored by professional, educational, and networking-foundational organizations. Choice Associates, Ross Retail Club, and the LSA Opportunity Hub collectively helped open the seemingly locked doors into the fashion industry for U of M students on April 13th. Attendees were encouraged to ask questions, share resumes, and connect with professionals during this session, growing their networks and capitalizing on the resources accessible at the MFMS. Special thanks to our Career Experts from Choice Associates, Jamie Klein Sztoser and Marissa Klein, for providing our students with incredibly valuable insight. In our final panel of the day, Mike Hondorp, formerly Instagram’s Global Lead of Shopping and now Chief Growth Officer at Whalar, Jennifer Bandier, Founder of BANDIER, and Wendy Steinberg, Group President of Betsey Johnson at Steve Madden, took the Robertson stage to discuss "Fashion’s Future: Where Collaboration Meets Convenience." Through a conversation MC’ed by Marcus Collins, veteran U of M speaker, Ross Professor, and recently promoted Chief Consumer Connections Officer at Doner, we learned the importance of convenience in the palm of your hand. “I do fundamentally believe we have changed the game in advertising because we are able to be relevant to you,” Hondorp added, touching on an important and commonly addressed point throughout the summit, “That’s the power of social media to be able to be talking to the right people, at the right time, with the right product.” And as we know, Instagram is the leading channel for our generation. Each speaker clearly addressed the importance of the brand, simplified best by Collins when he defined it as “a badge of that identity.” Wendy Steinberg piggybacked his point well, stating that Steve Madden strives for the “cool factor” in their marketing pursuits to connect with the consumer and create brand affinity. Olivia Palermo and Edward Barsamian, Style Editor at Vogue.com, had great chemistry on stage as longtime friends and colleagues. Ms. Palermo took us through her story, starting as a lacrosse player in high school which lead to a career-ending injury that changed the trajectory of her life into one that made her game fashion. She took off for Paris, immersing herself in fashion’s capital and educating herself at the American University of Paris. While she always had an edge for style, it was in Paris where she transformed her ideas about fashion into a tangible business. Ms. Palermo is an American entrepreneur and global style icon. Known for her unique sense of style, Ms. Palermo has leveraged her ability to balance a high and low aesthetic into multiple collaborations across the accessory, beauty, and fashion sectors. Ms. Palermo told personal stories from her experiences of becoming the first women’s global brand ambassador for Banana Republic, to starring in a recent campaign for Bobbi Brown, and working with global brands alike. With more than a decade in the industry, Ms. Palermo continues to grow and expand her audience and brand through new partnerships, seeking out emerging talent, and making it accessible to her combined seven million followers. To close out our day, the MFMS team transformed Robertson Auditorium into a NYFW runway – with an MFMS twist. The MFMS x SHEI Magazine Fashion Show presented by The Somerset Collection, who kindly donated twenty head-to-toe outfits from casual street wear to avant-garde looks for our student models to strut around the auditorium. The Fashion Show granted the audience an exclusive look at the hottest Spring 2018 looks that will be featured this season at the Somerset Collection. To introduce the show, Nathan Forbes, President and Managing Partner of The Forbes Company, introducing our audience to the power of retail moments before they experienced it presented before their eyes. The Forbes Company is a family-owned, independent company that is regarded for its ability to redefine retail in a marketplace through innovation, fashion leadership, distinctive architecture, and luxury appointments. They develop, own, and manage luxury shopping destinations such as the Somerset Collection, commanding today’s tough brick-and-mortar landscape. “If you are not reinventing your brand everyday, you will lose,” Forbes explained, “Change is not a criticism of the past. it simply means the future will be different.” In today’s fast paced retail environment, change is not only desired by customers, but crucial to keep businesses alive. While e-commerce has opened up many doors for the retail business, the likelihood of purchase is exponentially increased when customers have the chance to touch and feel an item. Brick-and-mortar, therefore, can’t be forgotten. The MFMS x SHEI Magazine Fashion Show was the grand finale of the 2018 MFMS. The Robertson Auditorium, a space never before used for any sort of production like this, was brought to life with a visual and auditory experience of music, models, and outfits. The MFMS was built on three goals: to inspire and educate the next generation of fashion industry leaders; to create and connect a network of like-minded and fashionably-profound individuals; to break the stigma about how fashion is portrayed at the University of Michigan. Her statement captivated the essence of the MFMS, not just in its foundation but also in the content shared and the inspiration felt throughout the entirety of April 13th. Ryan then brought the whole MFMS team on stage, giving special shoutouts to the executive board who worked tirelessly for months to bring us to that very moment. “The future of fashion is standing right behind me.” Stay tuned; we’re not going anywhere.